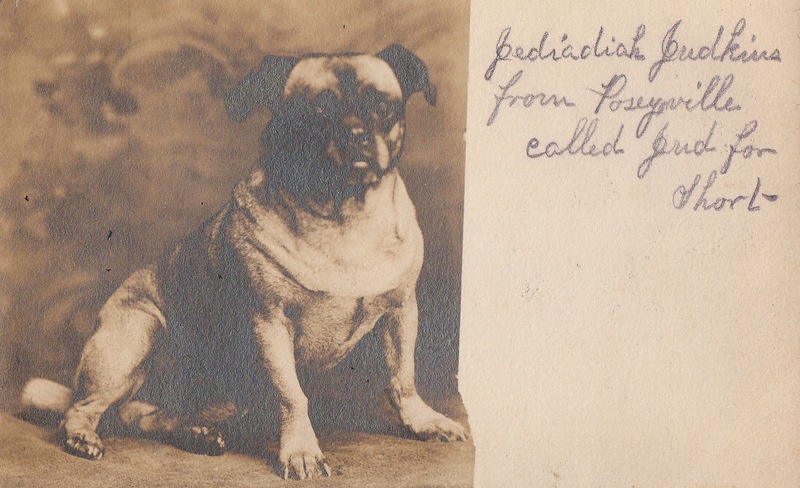 I recently purchased this real photo postcard (from about 1910) of a charming pug because of his nickname: Pediadiah Pudkins from Poseyville (Pud “for short”). (Forgive the sheen in the image; it is actually part of the photograph.) The card was addressed to a recipient in Davison, Michigan but was never sent, and the owner didn’t sign the card. I have to admit that I still develop elaborate nicknames for my pets, a habit that inflicts all the members of my family. Over twelve years, my much loved dog Patti became “Miss Poozle” (her hypothetical breed), Bean, Beanie Lou, Patti Lou, and Patricia Louise (if she did something really naughty). It’s really a form of play, I think, which fits with my sense that pet keeping for many folks is a form of leisure and play. Pud doesn’t look like the typical pug of today. His nose is longer and he probably breathed a little more easily. He’s clearly got the pug attitude, however, along with the portly body — and his owner doted on him. If you’d like to share your pet’s nicknames, you can do it in the comments section below. Benny, my schnauzer/jack russell mix also goes by Benson Bartholomew (his government name), Benny the Ninja (he’s quite the escape artist), and Little Sugar Muffin (when he’s being adorable). I wish I had given him a really cool long name like Pud’s, very Westminster. By the way, Patricia Louise is genius. Have a very small black cat named Onyx. Call her Nubbin (due to size), Nub, Bun (nub backwards), Bunny (extension of Bun), Muffin (sounds like Nubbin)… It’s all word play really. I call my snowshoe cat (a mix of Siamese and I don’t know what) “loosey goosey” because she is neurotic. Her name is Lucy and I love shouting “Lucy, I’m home” when I come in after work.